Southern Exposure is excited to share a new online publication created in conjunction with the fall 2012 project Making a Scene. Michele Carlson, Sarah Hotchkiss, and Genevieve Quick were commissioned to respond to the artists' unfolding work. 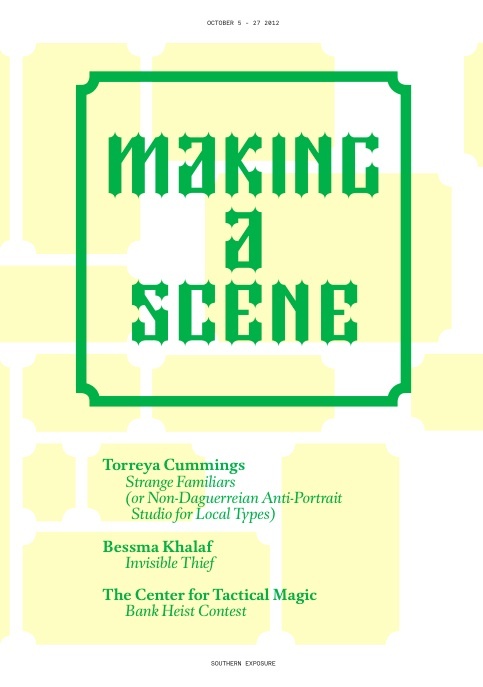 Making a Scene was a project by Torreya Cummings, Bessma Khalaf, and the Center for Tactical Magic, who all took up residency at Southern Exposure in October 2012 to develop new projects on site. Each of these artists plays with the mundane and the magical in transformative or risky experiments that provoke their viewers to performative, unexpected and humorous acts. During their three-week projects, the artists invited participants to engage in unexpected and performative ways as they develop new bodies of work and build on installations in process.